Well, this wagon isn't exactly built from scratch, but rather it is a converted Airfix ancient British chariot. I mentioned this in an earlier post. 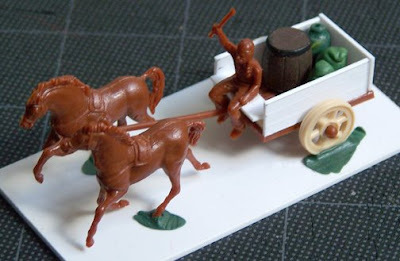 I think that now that I have the newer Hat chariots these Airfix chariot models would be better served as baggage carts. Good use of old models. I hate seeing stuff go to waste. Thanks. A a bunch of the Airfix Britons are still pretty crumby, but a few are still useable. For Song of Arthur and Merlin I'm painting some 1/72 Saxons (by MiniArt). The lone archer in the warband is from the same Airfix Ancient British set. The proportions are actually quite similar. Very nice! 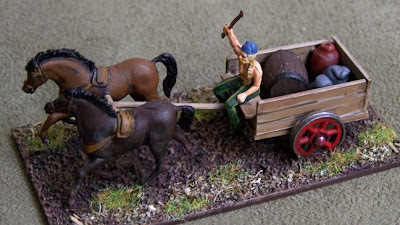 I really must get on with converting a couple of mine in to Sea Peoples wagons. A creative use of stuff from the 'Bits Box'. I like! I bought maybe 5 boxes of the Hat Airfix reissues after hearing a rumor that they were going out of production. This was before Hat even had plans to make their own chariots. So, now I am left with a whole bunch of these things! I'm happy with how this cart came out. I'll be sure to make more.